For the first time in India, Hyderabad has begun implementing a points system to penalize traffic violators. The system has just gone live, and over 1000 traffic violators have already been booked. And from the looks of it, this could soon become a nationwide trend. This system is in addition to the regular fines that violators will have to pay for traffic offenses. What? How does this work! The cops in Hyderabad have assigned a specific points for specific traffic offences. For example, if you don’t wear a helmet while riding a two wheeler, your license will be docked by one point. No insurance for your vehicle? You lose 2 points. Driving drunk? You’ll lose 4 points. And if the tally for individual traffic offences hit the 12 point mark, you’ll lose your driving license for one year. 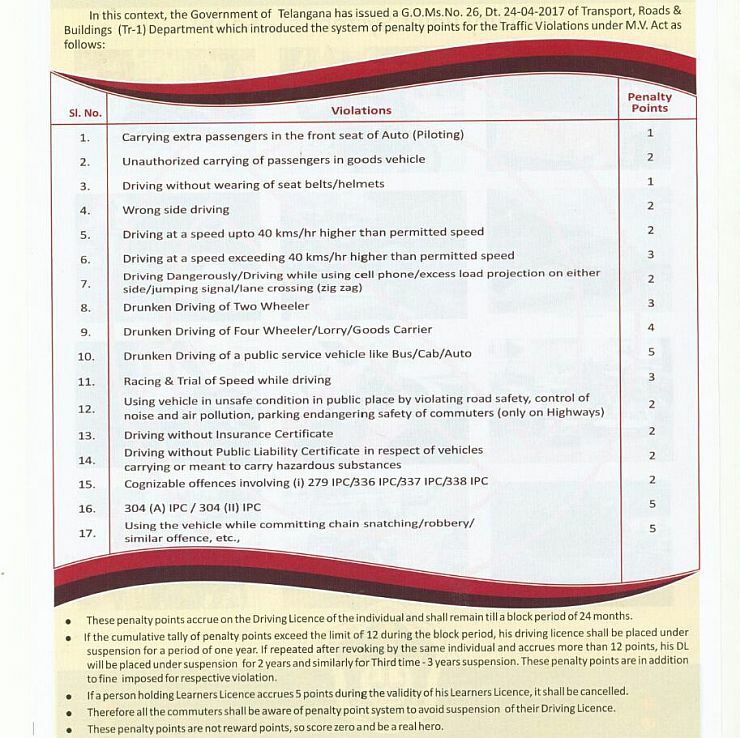 The second time you accumulate twelve points for traffic violations, your license will be suspended for 2 years. The third time it happens, the license will be suspended for 3 years. The whole idea behind this system is to prevent people from breaking traffic rules, and also to penalize repeat offenders with license suspension. Even learners won’t be spared under the new system, as the learner’s license will be cancelled when traffic violations amount to 5 points. What happens if you continue driving when your license is suspended? You go to jail for three months. The vehicle you’re driving will be seized, and a charge-sheet will be filed against you. The Noida RTO has recommended that 21,000+ driving licenses be cancelled for over-speeding, which happens to be major cause of road accidents in India. The Noida RTO will also start cancelling licenses for repeat offences. Recently, the Motor Vehicle Department of Kerala also suspended nearly 1.5 lakh driving licenses. With more RTOs across the country cancelling the driving licenses of repeat offenders, roads in India could get safer if this rule is followed to the book without corruption diluting it. Previous Post:How to get SBI credit card? State Bank of India is offering it for free!